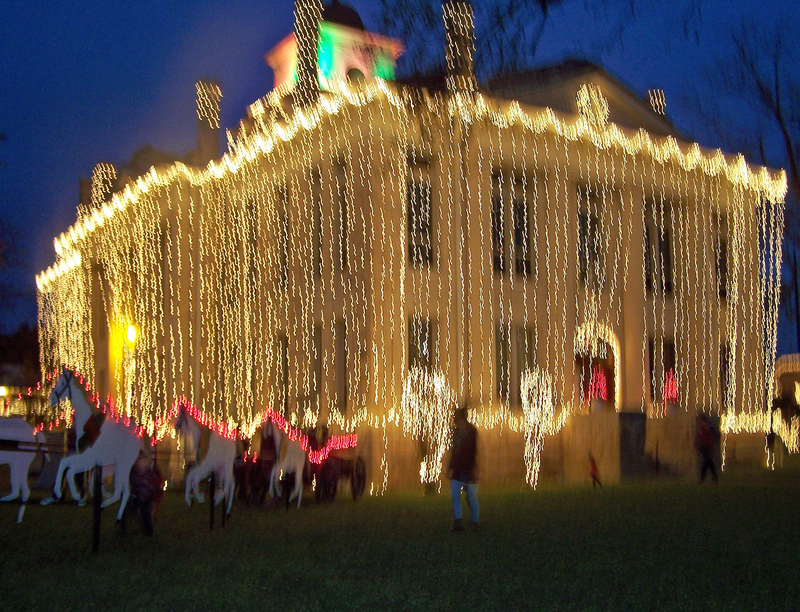 We spent the weekend after Thanksgiving in Johnson City, Texas, where they established the tradition of firing up for the Christmas holidays by covering the Blanco County courthouse with god-knows-how-many hundreds-of-thousands of lights, hanging in strands from the roof edge to the ground and noting the start of the holiday season in the Hill Country with a bang … a round of fireworks at about 7 PM Friday, as soon as it was well-dark. The firework show was lavish – and the three rows of vendor pavilions and the spectators in courthouse square were so close to it that little bits of spent ash from the fireworks sifted down on us. I hadn’t seen anything so splendid, or been so close – practically underneath it all – since a Fourth of July celebration at the Rio Cibolo Ranch in 2009. The Blanco Courhouse – all lit up. The nearest available affordable lodgings turned out to be at the Miller Creek RV Resort, which has three little cabins with a bathroom and functional kitchenette for rent. We booked one for two nights; the cabin porch presented a lovely view of the creek, which we were never to relish, as we were there only to sleep – long and deeply, following ten or twelve hours of active selling. The Miller’s Creek RV Park is a lovely little place, by the way; immaculately groomed and landscaped. It’s not one of those luxury destination RV resorts by any means, but a modest comfortable place, beautifully arranged – they even have a minuscule dog park, in addition to the usual facilities. 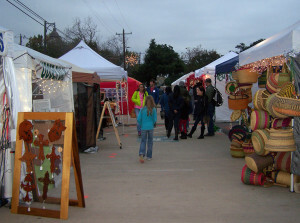 A look down the Market area. Any number of those polite teenagers came and bought origami earrings from my daughter, or inveigled their parents to buy them – indeed, there was one particularly engaging teenager who admired the earrings so much that my daughter sighed and gave her the particular pair that she favored, asking only that when Engaging Teenager had the money, to come back and pay for them. The very next night, Engaging Teenager returned with four crumpled dollar bills and four quarters. She confessed to wanting to be a writer and talked at length about what she liked in the way of books, how she kept being distracted by new ideas when writing, and how she was bound and determined to finish a story of hers for her grandmother’s Christmas present – because Gran had asked for just that thing. Engaging Teenager has the very same problem that I did, way back in the early days of my scribbling career; to whit – never being able to finish anything. We talked for a bit about that; reassuring and encouraging Engaging Teenager as an aspiring writer, though I suppose that we will never know if we did her any good. I did give her a copy of Lone Star Sons (autographed with a personal message, of course! ), assuring Engaging Teenager that my one YA book venture might be a help in demonstrating the art of short adventure-writing. Such a nice kid – we hope that later teenagery won’t spoil her charm and spirit. There was the procession of lighted automobiles, trucks, and tractors, some of them towing floats for the lighted parade on Saturday, the marching band and the senior citizen synchronized marching team with their lighted lawn-chairs … it was all very reassuring to me. Small-town America is still here, still confident, still ably conducting their own affairs, neighbor to neighbor – even when the neighbor is only a member of the peripatetic small-business gypsy-market. (I took pictures, using the ‘night’ function on the camera. Alas – none of those pictures came out very well at all. Speaking of gypsy marketing; I bought my Christmas present indulgence for myself; a pair of vintage earrings from one of the other vendors. His family business specialized in vintage and estate jewelry, mostly silver and a large part reclaimed from a smelter in San Antonio. You know – those businesses who buy old silver and gold jewelry; it goes to be melted down. This enterprise has an agreement with the local smelter to let them come in, look over the takings and purchase at cost those items with artistic merit. But my Christmas present for myself wasn’t one of those so rescued; they were from an estate sale. 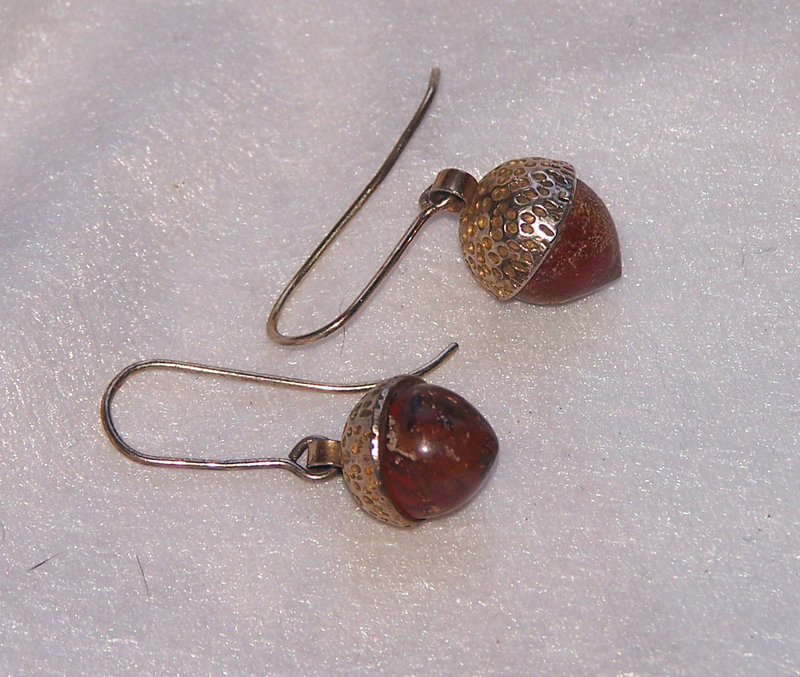 Described as silver – I thought they had a gold wash – and reddish-brown jasper stones; this was a pair of acorn-shaped earrings. I liked them very much, especially as they go with the brown tweed Edwardian walking suit outfit. So – my present for myself. Oh, and I wore a different vintage outfit every one of the three days. They worked very well for merchandising purposes – and yes, I will do this again. Many times.